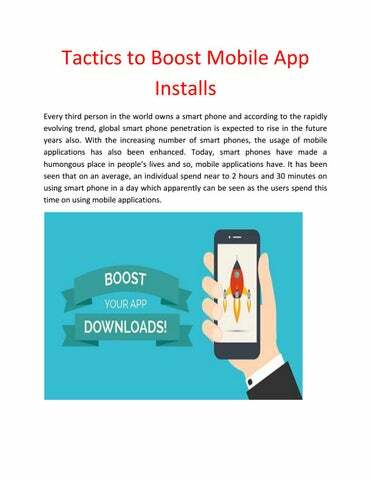 Tactics to Boost Mobile App Installs Every third person in the world owns a smart phone and according to the rapidly evolving trend, global smart phone penetration is expected to rise in the future years also. With the increasing number of smart phones, the usage of mobile applications has also been enhanced. Today, smart phones have made a humongous place in peopleâ&#x20AC;&#x2122;s lives and so, mobile applications have. It has been seen that on an average, an individual spend near to 2 hours and 30 minutes on using smart phone in a day which apparently can be seen as the users spend this time on using mobile applications. Evolution of Mobile Applications Google Play Store and Appleâ&#x20AC;&#x2122;s App Store are the two major platforms for mobile applications and as of 2017, approximately 2.8 billion and 2.2 billion applications are available on both these platforms respectively. The growth of both these platforms is directly proportional to the emergence of mobile app development Company. The role of these companies is not only to make mobile applications as per clientsâ&#x20AC;&#x2122; requirements, but they also suggest certain crucial ways to promote their applications in order to enhance the count of installs. 1. App Store Optimization (ASO) This strategy should be prioritized amongst all the techniques as it is worth using to boost up download for mobile app. It is very simple technique that mainly focuses on improving the app visibility by optimizing all the metadata elements of an app i.e. keywords, description, title, etc. The process of execution of ASO varies on the basis of trendsâ&#x20AC;&#x2122; best practices followed by the store. The objective of ASO is to enhance and maintain the visibility of the particular application on top so that users could more easily find and download it. This is one of the cost-effective techniques and it is implemented to boost up downloads of applications, thus, it is considered as reliable, responsive as well as result oriented approach. Mobile app development companies could learn the ASO technique through numerous tutorials available on the internet. Apart from this, App Tweak tool could also be used for getting more insights of the features of ASO along with understanding the significance of the keywords. 2. App Referrals This is one of the trendy approaches for enhancing the number of downloads of an app. App referral is somewhere inspired by word of mouth technique because when someone finds something substantial and relevant, he/she promotes the same in their surroundings. App referral also functions in the same manner and by using this technique, mobile app development companies could easily uplift the number of installs for the applications. This technique is generally implemented at the initial stage i.e. at the time of launching in order to spread awareness amongst the target audience. Companies could offer certain benefits to their users to invite their friends, family members, etc. and download particular app. As soon as the invited user installs the application, both referee and the referrer get the referral benefit. Food delivery applications and cab services applications have been the precursor of app referrals as they offered a free meal or free ride against every successful invite which resulted in great numbers. 3. Social Media outreach Prior to the selection of social media networks to promote the applications, you should know the nature of your application so that the appâ&#x20AC;&#x2122;s personality could correlate with the selected social media voice. For example, if the nature of the application is cool and trendy, the language used for conversing with the audience should be engaging and if the application is made for educational and other professional purposes, then the persona of the language should also be the same. Major social media platforms available for attracting the users are: Facebook Instagram Twitter YouTube Snapchat LinkedIn Every platform has its own sort of audience, thus, the information posted on these platforms should be managed accordingly. Along with this, these platforms are known to be engaging so, the content should also be connecting. Replying to the usersâ&#x20AC;&#x2122; comments could also result in the development of the relationship and that will ultimately lead to enhance the download. 1. Target Definite Audience Companies should target the audience on the basis of a localized marketing campaign for mobile applications. App marketing services include local or regional market research for making applications popular in a particular area. It offers you the opportunity of targeting real potential customers, unlike other forms of advertisement that target many people. Enterprises can also earn revenues from an app that is popular in a specific region. retention rate surely increases the leads, and so the conversion rate. In other words, organizations can enjoy a boost in sales figures through improvement in retention rate. 3. Social Media Platform Social networking sites definitely have a huge impact and help brands to get heard and recognized by potential customers. You can also opt for paid advertisements since it allows enterprises to know more about the interests and hobbies of customers. 4. Improve Application's visibility App Store Optimization techniques are necessary elements of such services. With the help of ASO techniques, app marketing services can improve an app's visibility in the leading application stores like App Store and Google Play. Localization experts can also provide multi-lingual services for localization of apps. Here you read how you can boost your mobile app install and other app marketing strategies that will help your app to get popular.